A spontaneous kiss between a Marine just returned from Afghanistan and his male partner in Hawaii has become famous since a photo of the embrace emerged on Facebook during the weekend, drawing thousands of overwhelmingly supportive comments in a relatively new post-don't ask, don't tell military. Star-Advertiser. A Kaneohe couple wasn't planning on becoming famous or making splashy headlines, but the pair's happy homecoming has done just that. Hawaii News Now. 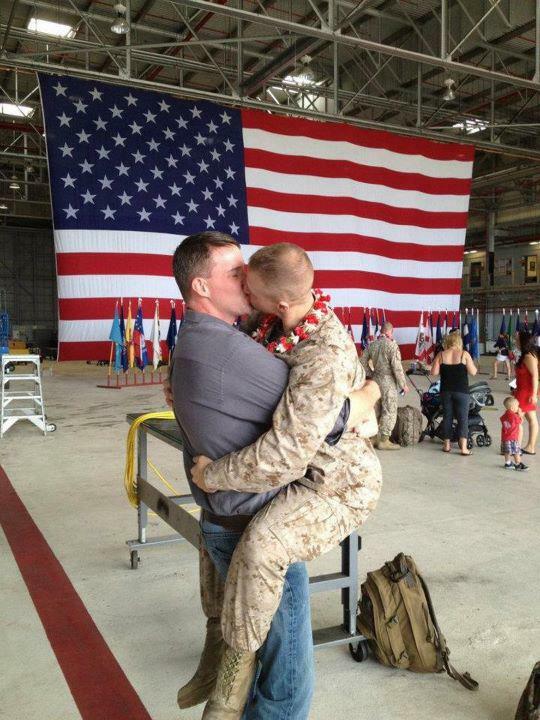 A Marines homecoming photo from a Hawaii base has gained worldwide attention -- two men kissing, just months after "Don't Ask Don't Tell" was repealed. KHON2. The state with the highest score for "well-being" is Hawaii, according to the Gallup-Healthways Well-Being Index, a poll that surveys the physical, mental and emotional health of Americans. KITV4. State Budget Solutions, a nonprofit advocating for fundamental reform of state budgets, released their study on the states that tax the highest number of services. Topping the list was Hawaii with 160 services taxed, followed by New Mexico and Washington that tied for second place with 158. Hawaii Reporter. The latest plan for state House and Senate districts tweaks some boundaries to keep communities intact but does not change district lines in seven areas where incumbent lawmakers would have to run against each other this year. Star-Advertiser. The Hawaii Reapportionment Commission appears to have listened to public comment at recent community hearings and tweaked political boundaries — again. Civil Beat. The reapportionment commission presented yet another version of voting district maps to the public today. KHON2. The success of movies like "The Descendants" and "Pirates of the Caribbean" and TV shows "Lost" and "Hawaii 5-0" have state lawmakers looking at ways to draw more productions to Hawaii. Associated Press. Hawai’i tourism officials provided an update for lawmakers today on areas they are targeting for the state’s share of foreign visitors. Hawaii Public Radio. Tsunamis generated by the magnitude-9 earthquake in Japan last March dragged 3 million to 4 million tons of debris into the ocean after tearing up Japanese harbors and homes. Associated Press. Federal funding to help Hawaii monitor beach water quality could dry up if President Barack Obama gets his way. Civil Beat. Two years after the state Civil Defense Division began an in-depth analysis of its response to a Hawaii tsunami warning in 2010, the final report has not been completed. Hawaii News Now. An environmental group has petitioned the federal government to outline what fines or other penalties it will impose on companies that fish within three marine national monuments in the Pacific. Associated Press. By an 80 to 20 percent margin, teachers in schools in the federal Race To The Top program have approved a new contract that will make them work longer, but will pay them more. Hawaii News Now. The well-known head of the Hawaii Solar Energy Association has been ousted from his position as board member and president of the trade group. Civil Beat. The family of Honolulu City Council member Tulsi Gabbard has been especially involved in her race for the 2nd Congressional District. Civil Beat. Rick Daysog, reporter for the Sacramento Bee and former reporter for The Honolulu Advertiser and the Honolulu Star-Bulletin, is coming back to Hawaii to work at the Hawaii Department of Business, Economic Development and Tourism’s State Energy Office. Pacific Business News. State roundup for Feb. 28. Associated Press. A group of property owners wants the Honolulu City Council to rescind a new law that has removed horses as "livestock" qualifying for a property tax discount. Star-Advertiser. Daniel Grabauskas' largest construction project as chief of Boston's transit system was more than 30 percent over budget and a year late. Civil Beat. A North Shore produce farm intends to become the first "urban farm" tenant in a community that developer D.R. Horton hopes to build in Ewa on some of Oahu's best farmland. Star-Advertiser. The zip line at the Honolii Mountain Outpost course recently built for Hilo-based eco-tourism company KapohoKine Adventures — had experienced a similar collapse prior to the accident that claimed the life of 36-year-old worker Ted Callaway. Tribune-Herald. The first of 13 co-defendants of The Hawaii Cannabis Ministry pleaded guilty in federal court Monday and has agreed to cooperate with the government in the drug-trafficking case. Star-Advertiser. Mayor Billy Kenoi's principal political opponent is sponsoring a bill limiting a mayor's ability to use county equipment and personnel to distribute newsletters six months before a mayoral election. West Hawaii Today. A lack of funding from the state Department of Transportation has put a long-awaited cargo storage facility at the Hilo International Airport on ice. Tribune-Herald. The long-sought Hawaiian Ocean View Estates well has been delayed by pump problems. West Hawaii Today. Attempt to prevent solar telescope suffers blow. Maui News. A proposal that seeks to place a 10 p.m. limit on music, entertainment and dancing at the Kihei Kalama Village complex is drawing heavy discussion. Maui Now. Wailuku attorney, Tony Takitani is among the nine-member Judicial Selection Commission that will be tasked with filling the US District Court seat being vacated by the retirement of Judge David Ezra in June. Maui Now. Kaua‘i Island Utility Cooperative had already begun installation of smart meters Friday, without any notification to residents of this small senior citizen condominium development on Jerves Street in Lihu‘e. Garden Island. Heavy weekend rains led to a brown water advisory for all of Kaua‘i Monday, and also forced workers to open the Kikiaola irrigation ditch to empty treated wastewater into Kikiaola Small Boat Harbor to prevent flooding. Garden Island. With water levels in the Kualapu`u Reservoir reaching concerning levels and little seasonal rain in sight, members of the Molokai Irrigation System, which serves the bulk of the island’s agricultural and homestead users, are starting to prepare for the worst. Molokai Dispatch.